“Boudoir Fetiche” mirror in brass and fine leather designed by Savvas Laz Savvas Laz is an Athens, Greece based luxury designer. He graduated from Écal ( École Cantonale D’ art de Lausanne, Switzerland) from the Advanced Master in Design for Luxury and Craftsmanship. Savvas Laz specialises in bespoke, handcrafted unique objects, trying to highlight the richness of arts and crafts. The “Boudoir Fetiche” collection is an ongoing series of unique everyday objects inspired by the world of Fetishism The “Boudoir Fetiche” Mirror (80cm) is composed of 1020 fine quality leather pieces of triangle geometry, applied to a brass mesh (3mm thickness), creating that way a unique textile of different types of leather and colour combinations . The glass is 6mm crystal clear mirror. The metal part is lacquered brass with a matte finishing on the big surface and polished on the edge to highlight its geometry. The little screws that hold the mirror on the metal surface are handmade and fitted inside the glass in order to create a united surface. The mirror is hanged on a brass base, creating a space between the object and the wall, giving the illusion of a floating object. The color combination of the texture of every mirror is unique and 100% customizable, ending up with an one of a kind object. Savvas Laz is a luxury designer with true passion for Craftsmanship. He graduated from the Master of Advanced Studies (MAS) in Design for Luxury & Craftsmanship of ÉCAL ( École Cantonale D’ art de Lausanne, Switzerland). Savvas Laz specialises in bespoke, handcrafted unique objects, with a mission to highlight the richness of arts and crafts. Story-telling is an essential ingredient in his design process. Historical research in combination with material exploration and exquisite craftsmanship, Savvas Laz aims to create unique objects of our everyday life. Marble, leather and brass are key materials in his design vocabulary as he approaches design from a more classic and long lasting point of view. Having worked next to artists and sculpture makers, his work applies both in the design and art field, as his objects have unique sculptural and artistic qualities. Savvas Laz collaborates with small, family workshops all around Greece trying to preserve and progress the "art of making". The studio’s work has been featured in important design and lifestyle publications including Dezeen, Domus, Esquire and many more. Founded in 2018 , SAVVAS LAZ studio is based in the historical centre of Athens, Greece. For your consideration a lovely brass and leather round wall mirror in the style of Jacques Adnet. High quality and beautiful. Handcrafted in The United States, circa, 2013. 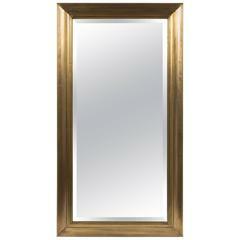 Handsome large brass wall mirror. Diamante mirror by Nicola Falcone Statement mirror. The shape of a luxurious diamond in Brushed brass and an iron structure painted in black or red. Handmade in Italy. Large wall mirror by Otto Schulz. Frame dressed in dark blue faux leather, decorated with numerous brass nails. Nice combination of elegance and playfulness. Glass and brass contemporary mirror - Belgian creation signed "JN" - Exclusively at Via Antica Using glass of Val Saint Lambert from the 1930s. Glass and brass contemporary mirror - Belgian creation signed "JN" - Exclusively At Via Antica using glass of Val Saint Lambert from the 1930s. Price par piece.